The Lab Cube is just one version of our already produced mobile forensic laboratory truck series. 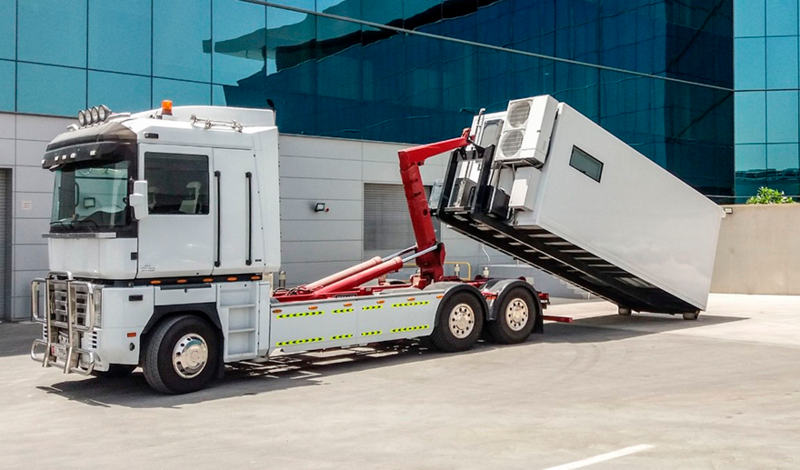 Every size is possible, from transporter to semi-trailer container. The dimensions of the vehicles can vary, as well as the body, the interior, the outfitting and the design. Intelligent room concepts combined with excellent hardware and software components, are co-ordinated with the customer in advance insuring maximum workflow. Each customer can have his unique vehicle assembled by us to suit their individual needs. Not only working on wheels, but also without them: the LAB Cube is the only completely independent forensic laboratory, which comes in a high-end roll-off cube on a truck. The autonomous cube has its own electric generator and can be placed anywhere you need for your IT-forensic investigations. It has a server room and an office area, separated from one another by a modern cabinet wall made out of frosted glass and lit by LED lights. Generator, A/C and lighting can be operated via a central control desk at comfortable working height. The unique swing rack, planned and constructed by mh SERVICE, holds the different server units safely. It consists of a steel frame, which is attached firmly to the frame of the vehicle. Another steel frame holding the server units is located within the outside frame. Both steel constructions are connected via air shock absorbers, which make sure that the roughness of any road is balanced out while the vehicle is in motion. The fully equipped office has four workstations arranged in a row. A conference table is located to the opposite of the desks and can be folded down or up when needed. A large presentation screen is located above the table. The adjustable designer chairs can be attached to the desk during transport. The cube also has a kitchen equipped with refrigerator, microwave, sink and coffee machine for long working sessions. With its total size of 11,5 m², the cubes’ interior feels very spacious. Four people can work next to each other comfortably.